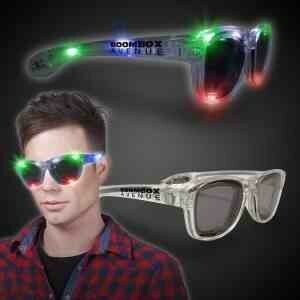 Keep the party going and look cool when you wear our multi color LED sunglasses. These battery operated light up sunglasses are made out of clear plastic and feature tinted lenses and red, green and blue LEDs throughout. With a click of the on/off button you can choose from 3 different light settings; slow flash, fast flash and steady on. One size fits most. 3 AG13 batteries includes and installed.